Almost everyone on the planet loves sour cream on baked potatoes. They go together like peas and carrots. Pancakes and maple syrup. Milk and cookies. They just do. Now, if you don't happen to subscribe to the Sour Cream Lover's Club, you can stop reading here. But if you're a member of the club like we are, and you also happen to be vegan, then you'll want to know this one simple little trick. 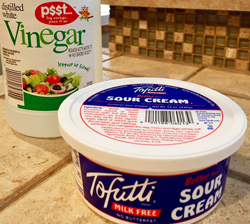 Tofutti Milk-Free Sour Cream substitute, PLUS 2 to 3 tablespoons of distilled white vinegar. That's it! While we love Tofutti and we believe they got almost everything right with their Better Than Sour Cream recipe, we couldn't help but feel a little underwhelmed when we put a spoonful of their smooth creamy sauce over our baked potato. It was missing a certain tanginess associated with real sour cream. Maybe because it didn't go through the bacterial fermentation process of souring. It's possible. We tried lemon, but honestly, it just tasted like lemon cream, then we tried lime, but ended up with a similar result, either of which would be delicious in a Jalapeno Cilantro Cream Dipping Sauce, which we'll get into later, but you may not want that on your baked potato. Then we decided to try distilled white vinegar. And Wallah! A better Tofutti Dairy-Free Sour Cream substitute was created! This is the sour cream you want on your baked potato! Thanks, Tofutti! We really do love you!